The procedure is locked because it was completed more than a specified number of days ago (according to a certain ledger option), and a patient or an insurance payment has been posted for it. In this case, you can void the procedure, re-post it correctly, and then post an offsetting adjustment if needed. The procedure is attached to an insurance claim. Open the Progress Notes tab of a patient's clinical record. The Edit Procedure dialog box appears. Change the information for the procedure (such as the date, provider, amount, treatment area, or procedure note) as needed. Date - The date of service. Leave the current date entered, or click (or tap) in the field to select a different date. However, you cannot backdate a procedure to a date that would cause it to become locked based on your organization's transaction lock setting. Provider - The provider who performed the procedures (rendering provider). Note: If you want to change the provider of the procedure, but the provider who is currently selected has been inactivated, you must first reactivate that provider. Status - A completed, treatment-planned, or existing procedure. Procedure - The procedures performed or products sold. Click (or tap) in the box, begin typing the code or description of the appropriate procedure, and then select the procedure to post. Bill to insurance - Whether the selected procedure should be billed to insurance. If the switch is On, the procedure can appear on a claim. If the switch is Off, the procedure cannot be added to a claim and will not be included in estimated insurance portion calculations. The default state of this switch is determined by the setup of the procedure code. Use caution when turning on this option for an alias procedure code or a non-standard code because some carriers may reject this procedure on a claim or may reject the entire claim due to the presence of an unrecognized procedure code. However, being able to bill a non-standard code, such as a rate code, to an insurance carrier is helpful for Federally Qualified Health Centers (FQHCs) when a rate code is needed for a wrap claim. If the patient has insurance coverage, there is a fee schedule attached to that insurance plan, and the selected provider is contracted with that carrier, the amount comes from the selected procedure on the contracted fee schedule. However, if the selected procedure does not exist on that fee schedule, the amount comes from the selected procedure on the selected provider's fee schedule. However, if the selected procedure does not exist on that fee schedule, or the selected provider does not have a fee schedule, the amount comes from the selected procedure on the procedure code list. If the patient has insurance coverage, but either a fee schedule is not attached to that insurance plan, or the selected provider is not contracted with that carrier, the amount comes from the selected procedure on the selected provider's fee schedule. However, if the selected procedure does not exist on that fee schedule, or the selected provider does not have a fee schedule, the amount comes from the selected procedure on the procedure code list. If the patient does not have insurance coverage and does not have a discount plan, the amount comes from the selected procedure on the selected provider's fee schedule. However, if the selected procedure does not exist on that fee schedule, or the selected provider does not have a fee schedule, the amount comes from the selected procedure on the procedure code list. If the patient does not have insurance coverage but has a discount plan, the amount comes from the selected procedure on the selected provider's fee schedule. However, if the selected procedure does not exist on that fee schedule, or the selected provider does not have a fee schedule, the amount comes from the selected procedure on the procedure code list. 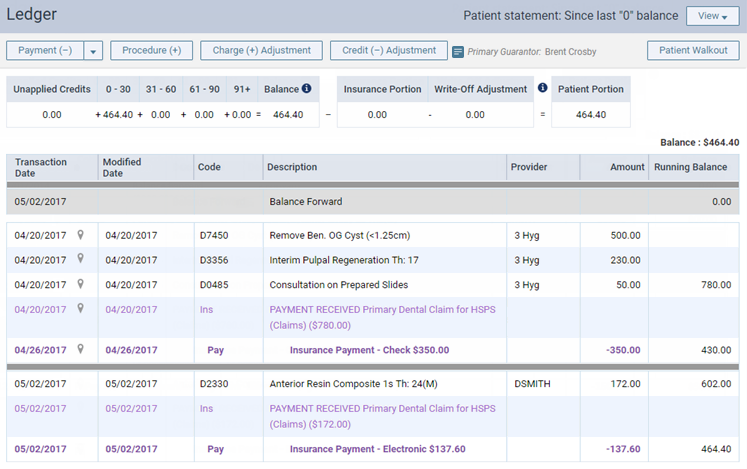 Also, a credit adjustment will be entered automatically in the Ledger for the difference between the charged amount and the amount for the selected procedure on the patient's discount fee schedule if the selected procedure exists on that fee schedule and if the amounts are different. Teeth, Surfaces, and so forth - If applicable for the selected procedure, specify the supporting treatment information, such as a Tooth number and Surfaces. Note: To change the tooth number to a supernumerary tooth number, do the following: for a permanent tooth, add 50 (for example, 16 + 50 = 66); for a primary tooth, add a letter "s" (for example, CS). Note - Any relevant notes regarding the procedure. The maximum length allowed for the note is 255 characters. Start/Completion Dates - The date the procedure was started, and the date it will be completed. To enter dates, you must first select the Require Start/Completion Dates check box. Insurance Estimate Overrides - An amount that differs from the estimated amount insurance will pay for primary coverage and/or secondary coverage. To enter an amount, you must first select the corresponding check box. The amount of the primary or secondary estimate, or the sum of both estimates, that you enter cannot exceed the amount being charged for the procedure. Orthodontic Treatment - If the procedure is for orthodontic treatment, select the Orthodontic Treatment check box. Then, enter the date that the orthodontic device was placed (in the Placement box) and the number of months that remain until the treatment is complete (in the Month Remaining box). These options are available only if an orthodontic procedure is selected. 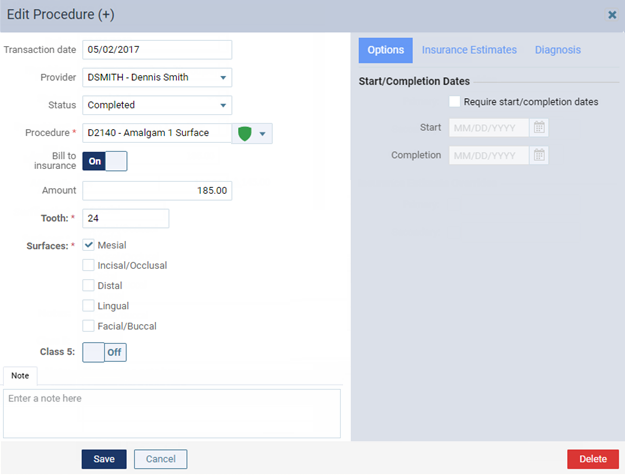 Note: When you create a claim for the procedure, the total number of months will be calculated (based on the placement date and remaining months) and entered on the claim automatically. Diagnosis - You can attach up to 20 diagnostic codes to the procedure. To attach a diagnosis to the procedure, select the Diagnosis tab; in the Diagnostic Codes search box, begin typing part of a condition's ICD-10 code, SNOMED code, or description to search for a condition that has been charted for the patient; continue typing as needed to narrow down the results list; and then select the correct diagnosis. Repeat as needed to attach other diagnoses to the procedure. Note: Conditions (diagnoses) can be associated automatically with a procedure when charting a quick exam. Chart one or more conditions; and then, with the same tooth (or teeth) selected, treatment plan a procedure to treat those conditions. 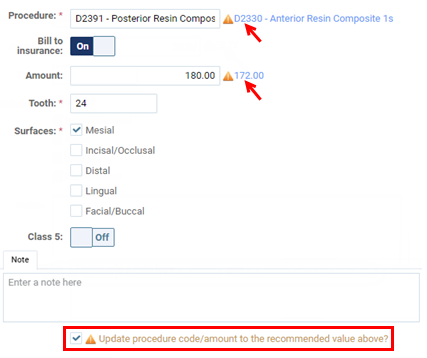 If the selected Procedure is not valid for the specified tooth number and/or treatment areas (such as surfaces), the recommended ADA Procedure Code appears next to the field. To use the recommended procedure, either click (or tap) the recommendation to insert that value into the Procedure field, or select the Update procedure code/amount to the recommended value above? check box to use the recommended value automatically when you save the procedure. To not use the recommended procedure, clear the Update procedure code/amount to the recommended value above? check box. If the Amount entered is different than the fee for the selected procedure in the patient's discount fee schedule (if applicable) or the provider's fee schedule (or if not applicable, the default fee for the procedure code), the recommended amount appears next to the field. To use the recommended amount, either click (or tap) the recommendation to insert that value into the Amount field, or select the Update procedure code/amount to the recommended value above? check box to use the recommended value automatically when you save the procedure. To not use the recommended amount, clear the Update procedure code/amount to the recommended value above? check box. If there are recommendations for both the Procedure and the Amount, but you want to use only one of those recommendations, click (or tap) the recommendation that you want to use, and then clear the Update procedure code/amount to the recommended value above? check box before saving the procedure.